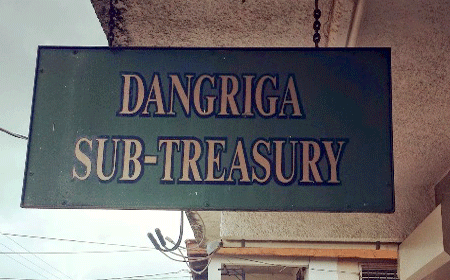 DANGRIGA, Stann Creek District, Fri. Aug. 11, 2017–A bare-faced thief with a sawed-off shotgun robbed the Dangriga Sub-Treasury, which is located in a building complex on Main Street, today. Reports are that the thief entered the premises, pointed the gun at the clerk, and demanded money. She got scared and handed over $1,700 cash that was in a drawer. The man then escaped on his bicycle with the stolen cash. The incident occurred at about 12:30 this afternoon. The clerk, who was the only public official at the Treasury at the time, told police that she was behind the counter, engaging in a business transaction with a woman, when a man walked into the office with a bag. On entering, the man opened the bag, and pulled out a sawed-off shotgun, but got the money he demanded without firing a shot or in any way physically harming anyone. Police face a challenge in locating the robber, because the two witnesses to the incident (the clerk and the woman she was serving) have no clue about the robber’s identity, even though he did not cover his face.